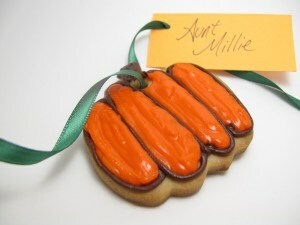 Simple Thanksgiving table idea: Make pumpkin cookies placecards. 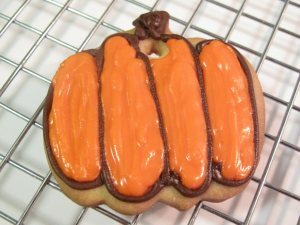 A yummy treat for after Thanksgiving dinner (or before), these pumpkin cookies placecards double as ways to tell your family where not to sit. 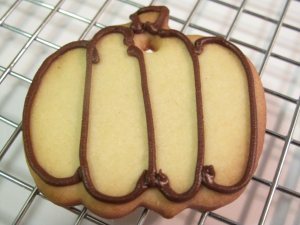 Roll out your cookie dough and cut out pumpkins. Place on parchment paper lined baking tray. 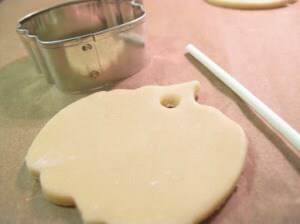 Before you bake, make hole near the top (beneath the stem) with the stick or straw. I used a lollipop stick, but circled it a bit to make the hole larger (about 1/4 inch). Bake as directed and let cool. Make a bag of orange frosting with a 4 tip and a bag of brown frosting with a 3 tip (using the bags, couplers, tips, and closing tightly with a rubber band). Outline the pumpkin with brown 3 tip. Let set. 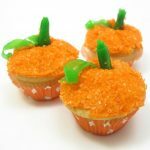 Fill stem with brown 3 tip and fill pumpkin with orange 4 tip. Let dry (overnight preferred). 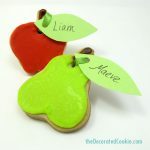 Cut out rectangles from your card stock and write your guests names on the tags. Punch a small hole in the corner. Thread ribbon through the cookie hole, loop like a vine, and attach the other end through the hole of the card. Arrange on the center of the dinner plate. Voila! Now you can seat gossipy Aunt Millie at the far end of the table. 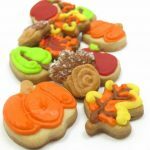 Tips: If you have trouble getting the ribbon through the cookie or card, cut ribbon end to a point or use a pin or needle to help you. When you arrange on the plate, try not to let the name tag touch the cookie. Grease from the cookie can damage the paper. If you’re really ambitious: Use one looooooooooooooooooong piece of thin, green ribbon and attach all the pumpkins around the table (as in, the pumpkins are in their pumpkin patch, attached by the vine). Oh wow! that’s so cute! I love how these turned out! The card detail is too cute! That is very creative! I love the green ribbon idea. 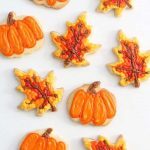 They’re so perfect for fall! Great idea. How cute! And thanks for the step by step photos! I’m so going to make these this Thanksgiving!! These are so cute! Do you let it dry overnight by just leaving it totally open to air or do you put it in a storage container? Thank you all for your comments! Good question Beth! Yes, you can let dry overnight either in a storage container or open air (no refrigeration necessary). I use a storage container simply to keep the cats and cat fur out, but open air is fine, too. They won’t get stale like bread. And because these aren’t being wrapped in bags and just placed on plates, it’s not even necessary for them to fully dry. I’m sure guests won’t mind. Nice ideas to make my cookies more attractive.